Freyssinet is at the forefront of specialised civil engineering technology, consultancy and installation, and a leading expert in concrete repairs, bridge bearings, post-tensioning, expansion joints, jacking, cathodic protection and sprayed concrete. 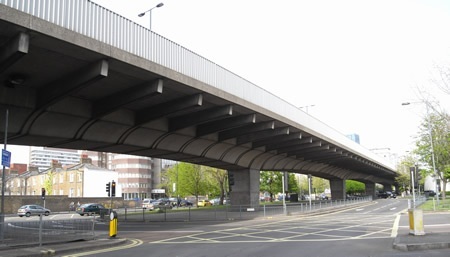 Transport for London (TFL) was carrying out a £100M program of works on the Hammersmith Flyover to restore its capacity and ensure it would see through the next 60 years without any further major maintenance. Ultra-High performance Fibre Reinforced Concrete (UHPFRC) was chosen to repair the concrete; UHPFRC had not been used in this application before in the UK. Freyssinet was appointed to validate the performance of the UHPFRC under service loads to confirm the ability of the blisters to transfer the pre-stressing anchorage forces. As Lucideon has extensive experience of testing clay and concrete products in their UKAS-accredited laboratories, Freyssinet selected Lucideon to conduct flexural strength and modulus of elasticity testing on UHPFRC. Over a twelve month period, samples were delivered weekly to Lucideon. Daily testing was carried out to ensure that the concrete cast during each stage met the necessary requirements. The testing carried out by Lucideon provided recorded evidence that the strength requirements of the UHPFRC were met at each stage of the process. This enabled Freyssinet to prove that the restoration to the flyover would stand the test of time.